We have two reviews for recently released games coming this upcoming week at SuperPhillip Central. In the meantime, we realize that reviews for old games are ones that a fair portion of people don't care for. Regardless, we do not show any prejudice to a game's age when we decide to review a given game. That said, here is our review of Fortune Street/Boom Street for Nintendo Wii. The Itadaki Street franchise is one that has existed since 1991 when it debuted on the original Famicom system in Japan, devised by Dragon Quest series designer Yuji Horii. After the Famicom original, Itadaki Street rolled the die on multiple platforms, including the Super Famicom, PlayStation 1, PlayStation 2 and Nintendo DS. 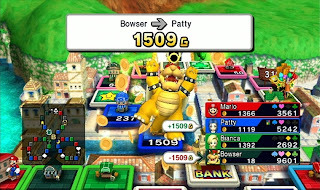 Square Enix's series has finally found its way to the West thanks to Nintendo in the form of Fortune Street/Boom Street, a take on Monopoly starring a roster of all-stars from the Super Mario and Dragon Quest franchises. 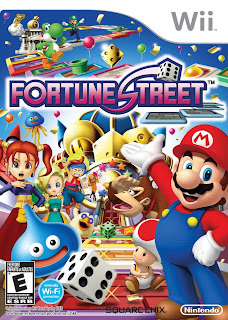 Does Fortune Street strike it rich, or is it a total bust? Fortune Street takes great inspiration from Monopoly, but it offers its own personal flair to make for a unique experience-- though a much more complicated one that takes time to learn. Thankfully, the game contains two rule sets, Easy and Standard, so beginners and pros alike can have a rule set that fits their play style and experience. 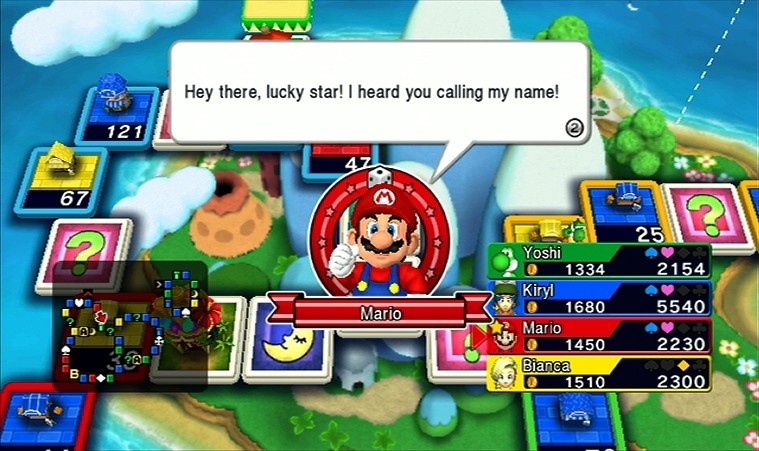 Both have the same goal, however, which is to bring your character's net worth to a given board's target amount and reach the bank before any other player. 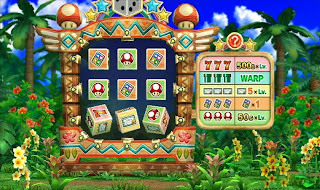 Regardless of which rule set you choose, the main aim to roll the die, wander around the board, purchasing and upgrading properties, and collecting all four suits (club, spade, diamond and heart) to take back to the bank for a cash bonus is the same. chatter when it is their turn. Landing on an empty shop space allows you the opportunity to purchase it. When another player lands on it, they have to pay you an amount that depends on how much money you invested in it. They can also opt to buy you out, though this costs five times the amount of your shop. It's to your advantage to buy up as many adjacent shops as possible, as their max capital and price with increase. In addition to that, you can invest in already owned shops when you land on any of your establishments. Thus, you begin earning a lot more money to buy more shops and increase your max worth. Are you following me still? It's convoluted at first, but once a few games (no, not turns-- games) have been played, you will get more comfortable with the ins and outs on how Fortune Street works. and a pair of new shops! 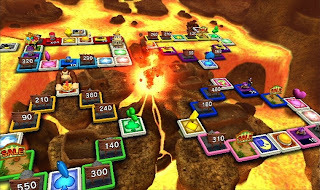 However, Standard Rules is where the real fun and complexity of Fortune Street comes into play. In addition to all of what Easy Rules have the offer, Standard shoves stocks, districts and more square types into the mix for a more strategic game. Stocks can be purchased at the bank and at designated squares, and will fluctuate as the game goes on. This is where districts come in, color coded areas of the board. Stocks can be invested in the various districts, and as more capital is invested in a given district to give higher shop values, the higher the worth of stock prices will be for that district. If shop prices go down or a lot of stocks are sold, a district's stock prices will go down. Fortunately, you can win big by buying stocks low and selling stocks high, or even investing heavily in a district where you own all the shops in. 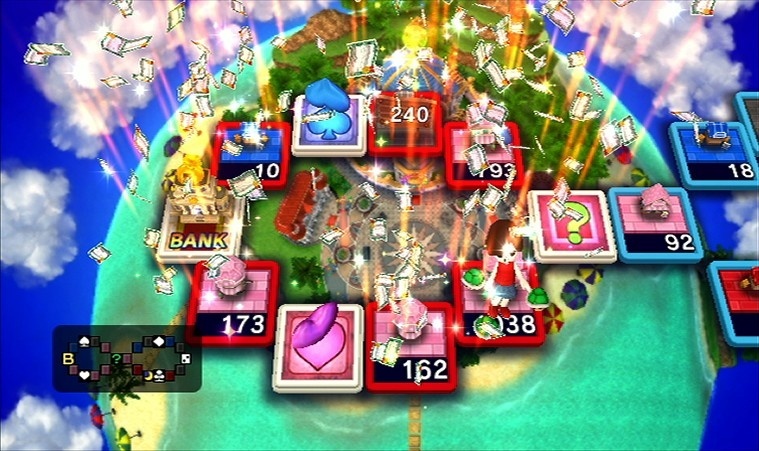 For single players, Fortune Street offers Tour Mode, which has multiple boards that have requirements that must be met to complete them. These are as simple as getting third, second, or first place (as you progress in the mode, the place you must earn is higher). This mode is how you unlock boards and characters for free play. 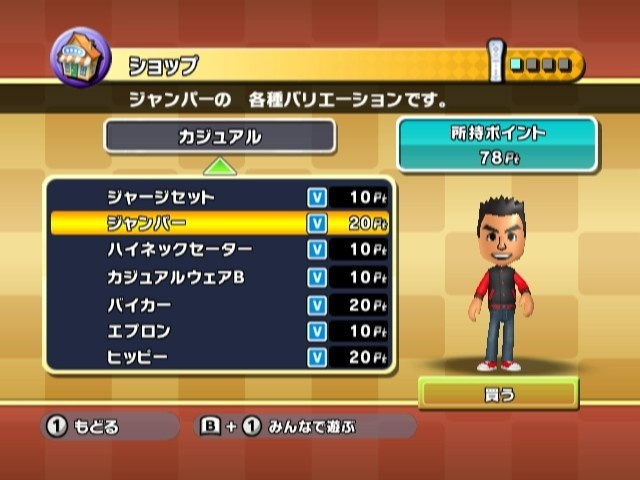 Unfortunately, speaking of characters, in Tour Mode you curiously can only play as your Mii. That's right. No Mario, no Yoshi, no Slime. Just your Mii and nobody else. Sure, you can customize your look with unlockable items and costume pieces, but it would have been nice to be able to play solo as whoever you wanted. Dress your Mii for success. 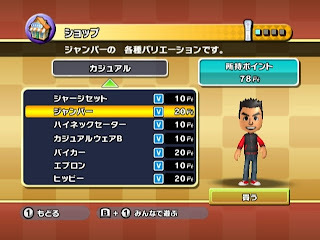 In addition to Tour Mode, single players without anyone for local multiplayer can hop online via the Nintendo Wi-Fi Connection to play one of two types of games: one against worldwide or nationwide opponents, and one against friends who you've shared friend codes with. The inability to save a current game's progress to leave and pick up another time is pretty damning, however, because Fortune Street games last a good while. The arcade space won't eat up your quarters. While not a graphically intensive title by any means, Fortune Street still runs well on the Wii hardware. 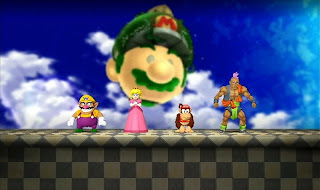 Characters move around the boards without any hiccups in frame-rate, and boards are crisp and colorful, representing their Mushroom Kingdom and Dragon Quest universe locales admirably. If you wish to make games go faster, there are an abundant amount of animations you can turn off. In the music department, Fortune Street features a wide range of familiar themes from both Mario and Dragon Quest series, remixed and sounding as great as ever. The presentation of Fortune Street succeeds in bringing some flash and pizzazz to what could otherwise be a very boring experience. spotlight and number of boards in Fortune Street. 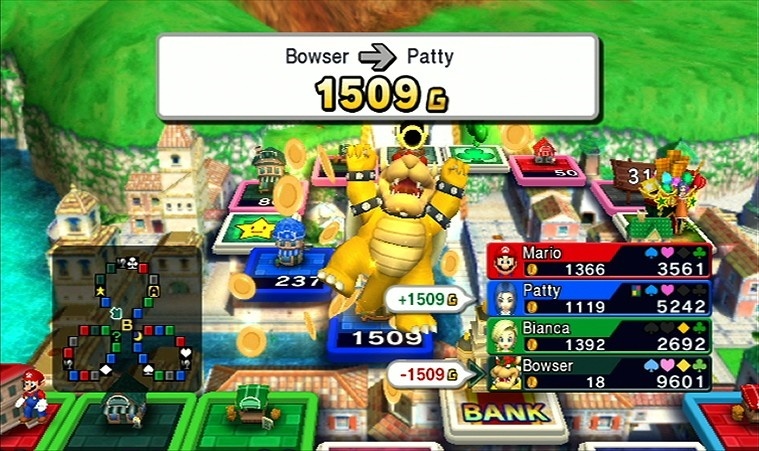 Fortune Street is not a party game for everyone. It most certainly will not excite the Mario Party crowd, and as a matter of fact, it really isn't for them. 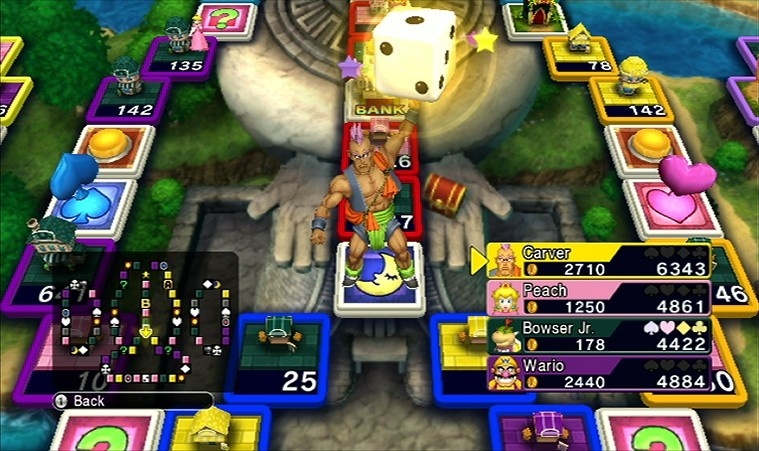 Fortune Street is a much more strategic and intricate game that you can't just roll the die and hope luck will let you win. That's not to say there is no element of chance to be found, but usually the winner is decided by who has played the best, quite unlike Mario Party. 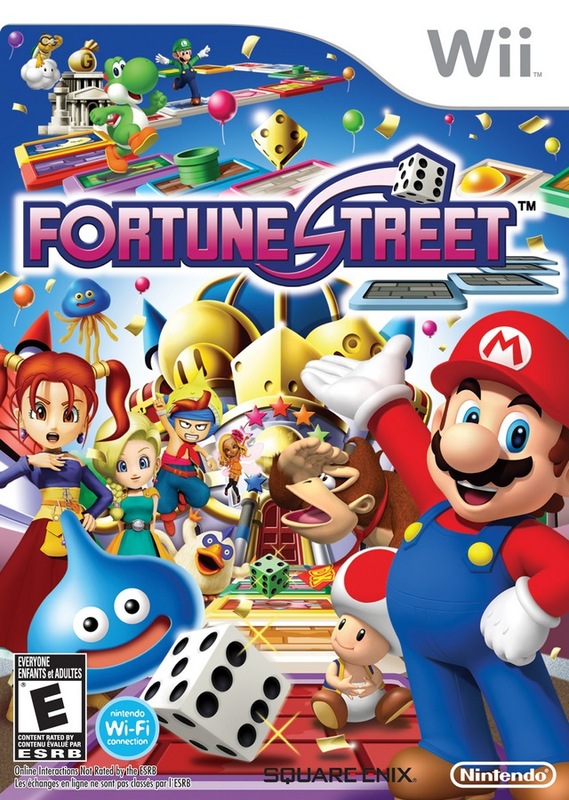 Despite its colorful appearance, Fortune Street isn't really recommended for the younger set. It's highly complicated, takes a while to learn, and quite frankly, those two aspects make it a difficult proposition for even someone my age. 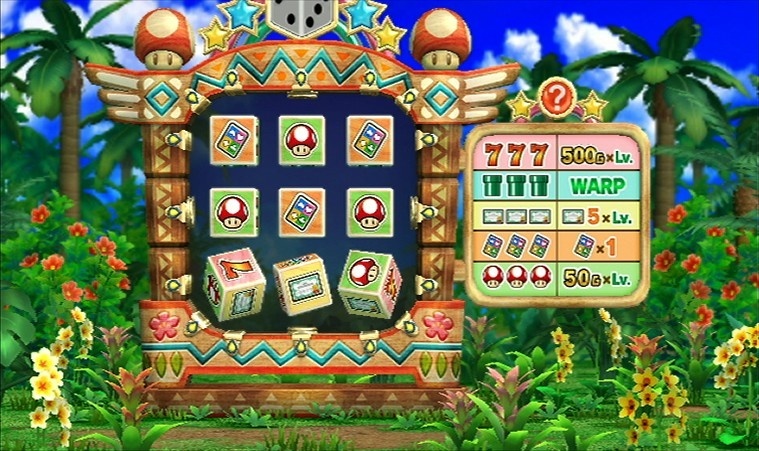 That said, if you can get the rules down and plan your moves accordingly, Fortune Street is a worthy investment for your Wii.